The Best Resources, Online and Offline, I Can Find Right Now to Help you Learn Spanish...RIGHT NOW! This page is constantly updated, I will maintain here a list of resources (websites, books, people, schools, courses, everything) that I think are worth your time to at least consider. This is a fantastic wealth of knowledge about language learning and language instruction in general (how to learn languages yourself as well as how to teach them to others), not to mention individual languages. This forum has been around for well over a decade now and contains hundreds of thousands of posts. It’s frequented by some of the most renowned polyglots and instructors in the world. You could spend months just reading about everyone’s different technique for learning this language or that, though I don’t recommend it (take action first, then adjust as you go). They have a whole section dedicated to discussing different methods as well as one dedicated to Spanish specifically where everyone writes only in Spanish (great place to practice your reading and writing skills, people will be very patient and are happy to correct you and help you out). I thought about trying to appear unbiased and putting this further down the page but then I thought “Nah, you’re not fooling anyone, they know you’ve got a book and that you want to sell it, they can scroll past it if they want”, so here it is. I also think that if you’re learning Spanish this is where you need to start because one of the biggest problems beginners have when learning their first language (regardless of which one it is) is that they have no clue as to how to learn a language. This is the source of the saying “The hardest foreign language to learn is always the first one”, and I absolutely agree with this. It’s always true in my experience because you’re having to do two very difficult and complicated things at once: learn how to learn a language while learning a language. So you have to learn Spanish at the same time you’re figuring out how to learn Spanish, and these are two separate, complex, and difficult skills to acquire…and you’re trying to do both at the same time. This means that you either need to be taught the language by somebody who handles both for you (they know how to teach a language and they provide/teach all the necessary material so you just sit there and learn by doing what they tell you) or you need to learn how to teach yourself the language and be shown where to obtain the necessary materials. My book does the latter. If you can afford to have a tutor do it all for you then that’s by far the preferred method (much faster and less frustrating than trying to do it yourself) but that’s going to cost you at least several thousand dollars to reach even basic fluency ($10-20 an hour minimum multiplied by months if not years worth of lessons, depending on how many hours you’re taking per week). 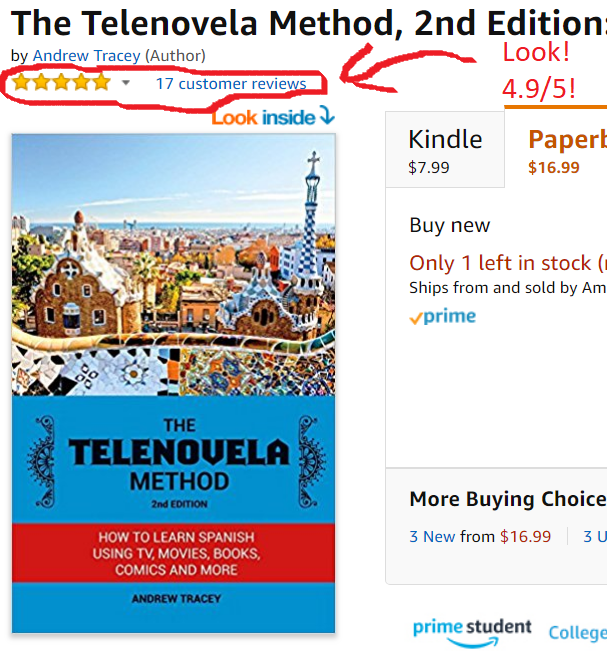 The method I advocate is called “the telenovela method” simply because telenovelas (soap operas) are what I started out with and it made for a catchy title, but I don’t recommend those above anything else, use whatever you want. What you do is study popular Spanish-language media that you like (whatever interests you: TV shows, movies, music, books, comics, news, etc.) in the correct fashion. No, I do not recommend just sitting there watching videos in Spanish and expecting to somehow passively pick up the language, no that doesn’t work, yes you have to look things up, note them, and then review them later. You learn how to speak and understand just like a native because you’re learning from and imitating Spanish as it’s used by native speakers on a daily basis. It’s just like English or any other language: excepting the odd period drama (e.g. something set in the 1700s), the actors on screen are going to talk like normal people. The language they use, the way they talk, is exactly the same way native speakers of that language talk every day to their friends, family, and coworkers. Imitate it and you learn to talk just like them. Do it enough and you’re conversationally fluent. It’s how I reached conversational fluency in Spanish in six months. 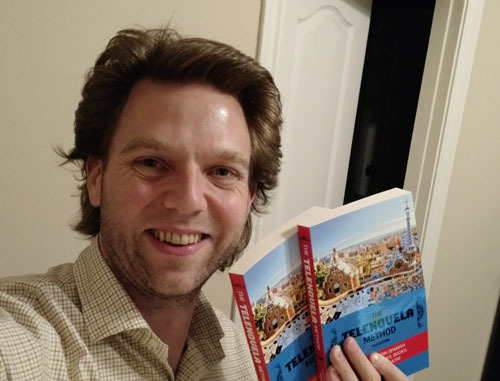 Caveat: I was devoting about four hours per day to this method – learning a language is not easy but it can be fun and interesting, it doesn’t need to be boring or unpleasant. Please consider giving me a chance and checking it out below from the following retailers (it can be had for as little as $7.99 as a Kindle e-book on Amazon, the paperback is usually $14.90). It’s also available through all major wholesalers so your local bookstore absolutely should be able to order it. I’ll start with a free one (also one of the best and very unique) so you don’t think I’m just pushing paid products here (most courses are not free, courses are complex, structured things that cost a lot of money to make). The concept behind Language Transfer is essentially getting you to understand the vital grammatical and syntactical aspects of the language by explaining them in a way that’s thorough and interesting such that you therefore remember them. It works…very well. Check out the Spanish course here. The caveat with these courses is that they just do one thing (though they do it very well): explain the language. You absolutely will not get anywhere near fluent with either this course alone nor with any other. I’m unaware of any stand-alone, self-study course that will, by itself, take the student from zero to fluency or even remotely close to it (and I’m even being very loose with the definition of “fluency” here, I mean like ~B2, not native fluency). You have to do a lot of other things (expose yourself to popular media in the language, converse with native speakers, read and write in the language, etc.). I would recommend supplementing a course like this with another one below and/or with the telenovela method, flashcards, Duolingo/Memrise, Yabla/FluentU, etc. No single one of these resources by itself can make you fluent in Spanish, or even get you near that point. This is by far my top recommendation not just for paid courses but courses overall. Why? It focuses heavily on speaking and pronunciation, their number one priority is getting you to speak, to sound, just like a native in a relatively short period of time (pulling this off in a few months is relatively fast in language-learning terms). The creator, Idahosa Ness, is a musician by trade and learned six languages to spoken fluency by listening to and imitating native speakers using techniques based on his musical training, initially by singing but later by imitating all forms of the spoken language. It’s a really interesting concept and I encourage you to at least give a quick glance at the video he has here explaining it. Don’t turn and run just yet, yes I know this sucker has been spammed to death on every language-learning website out there…but it’s actually a good course for the money. Here’s what happened: there’s this thing called “affiliate marketing” where you can get paid a commission if someone buys a product through a link on your website or in an email you send them. I do this (the above link to Rocket Spanish is an affiliate link of mine), most other for-profit websites do this. The problem is that because Rocket Spanish consistently converts fairly well (meaning people tend to buy it after they do the free trial and/or read the sales pitch), has a low refund rate (it’s a good course), the commission rate is high (around 60%), and the criteria to become an affiliate is really low (basically anyone can promote it), this all leads to everyone and their damn brother pushing it as hard as they can. So inevitably some less-than-scrupulous people spam the hell out of it and thereby tinge the course itself as “spammy” in lots of consumers’ eyes. I recommend you read my full review of Rocket Spanish that covers “the good, bad, and neutral” as I put it, if you’re seriously considering it. It’s a very good audio-video course you do in your browser (I believe you can download the lessons to do offline if you like), that has you immediately repeating after the (native) speaker, and which teaches the kind of basic and essential Spanish rank beginners need to learn. If you’re at an intermediate level or above it’s a waste of your time and money (maybe even if you’re an advanced beginner), but if you speak little to no Spanish and want a good course to get you started fast so you can be speaking with natives in language-exchanges via Skype (I’ll cover how/where to do that below) in a few weeks, for under a hundred dollars U.S., this is a great option. Plus, they offer a 5-day free trial that’s very popular. Very good reviews on Amazon (4.5/5 average from 354 reviews) though I have to admit I’ve never actually tried it myself. It’s also fairly expensive at $300-400. They offer a Latin American Spanish course as well as an Iberian Spanish (Spanish as it’s spoken in Spain) course. This one is decent and focused mainly on people who are traveling soon and will need to use the language in a few weeks. It focuses on the 138 most-spoken words and teaches them in travel-related themes (hotel, airport, ordering food, using a taxi, etc.). It’s also cheaper than many others.